An elaborate exhibit featuring Santa Cruz County received a Silver Medal at the California State Fair in Sacramento this month. 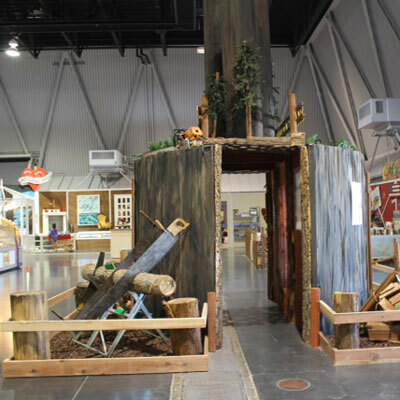 Sacramento, CA: An elaborate exhibit featuring Santa Cruz County received a Silver Medal at the California State Fair in Sacramento this month. The exhibit was among many County displays that were shown at the State Fair. More than 750,000 guests came to see “The Best” of California on display during the 17-day State Fair (July 11-27). As one of the featured exhibits, Santa Cruz County showcased our county fair’s 2014 theme, “Sew It, Grow It, Show It”. This unique program was first introduced at the State Fair in the 1870’s and has evolved into one of the most favored attractions because of its unique ways of highlighting California’s agriculture, diverse landscape, economy and culture. It is the only competition of this kind in the country to showcase all of the counties within a single state. “We are extremely pleased to have a presence at the State Fair and to receive this award,” said Steve Bontadelli, President of Agri-Culture. The Santa Cruz County Farm Bureau Young Farmers and Ranchers Committee and the organization Agri-Culture coordinated the exhibit along with the professional booth designers at Mikon Productions. The agricultural education organization, Agri-Culture serves as the lead organization in the fundraising drive within Santa Cruz County and comes up with the design. The Counties Exhibits are a cherished favorite at the State Fair and were viewed by the over 750 thousand people during the fair. “This is a huge marketing and outreach tool,” said Bontadelli. For those local citizens who didn’t make it to the State Fair this year, the Santa Cruz County exhibit will be on display as part of the Santa Cruz County Farm Bureau booth at the Santa Cruz County Fair in Watsonville (September 9-14).